Summer… A time to relax, enjoy the sun and enjoy the outdoors. A time to create memories watching beautiful sunsets while you sip on iced tea or wine and enjoy a barbecue with friends and family. A perfect and yummy recipe to kick-off the Summer! boil, slowly add in the orzo to the water and stir for a few seconds. Set a timer for 3 minutes, then stir and check if the orzo is done. It will take 3-4 minutes for the orzo to be cooked. After the orzo is fully cooked, drain the pasta, give it a quick rinse and move it to your salad bowl or platter to cool. 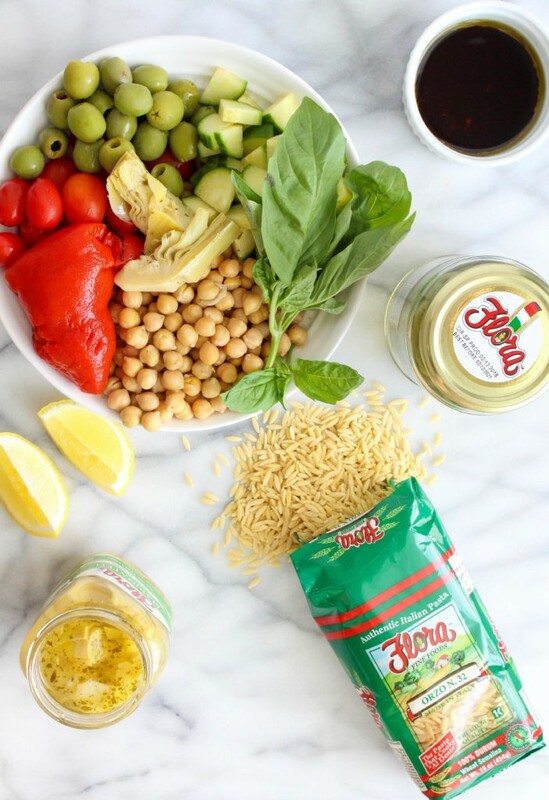 Slice your olives, chop your artichokes and roasted red bell pepper and add them to the orzo. Next, wash and chop the cucumber and cherry tomatoes. Peel and finely chop the red onion. Wash and finely chop the parsley and wash and rip up the basil leaves. Add everything to the orzo and add crumbled feta as well. Toss your salad then make the dressing. In a bowl, combine the juice of 1 lemon and the olive oil then drizzle it over the salad. Lastly, add a generous drizzle of the caprese basil vinegar glaze and serve! If you are making this salad ahead of time and plan to bring it to a party hold off on adding the dressing until you are ready to serve it.